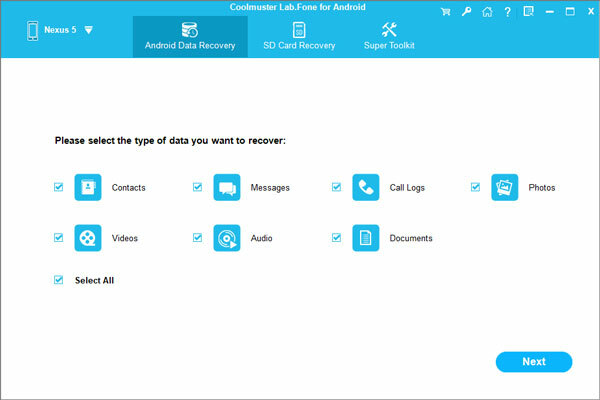 Home > Resources > Recover Android > How to Restore Data from Bricked Android Phone? A bricked Android phone means that your phone is stop working by not responding to any commands. Many reasons can lead to a bricked Android phone and rooting the phone is a common one among them. Well, your phone becomes a bricked phone is not the worst thing, what troubles you a lot is how to restore the entire data saved on it and data loss problem almost drives you mad and desperate. Don't panic, you can easily restore files from your bricked Android phone by going through this passage. Here is an ultimate tool named Android Data Recovery, which can drive you from the situations above and rescue all the data from bricked Android phone with just one click. 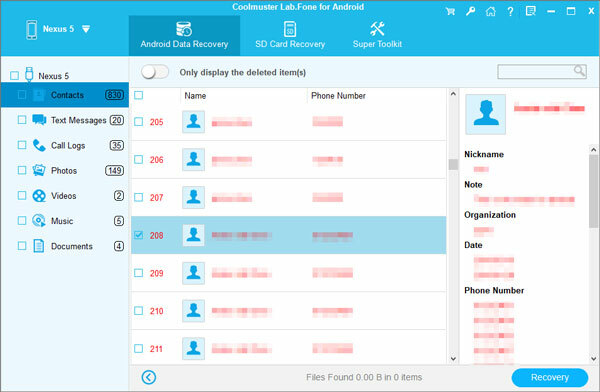 This program can be easily applied to recover all types of data, such as contacts, text messages, photos, videos, music, call history and documents from bricked Android phone (Samsung, HTC, Motorola, LG, Sony, Huawei, ZTE, Google Nexus and etc.) on Windows or Mac computers and laptops. The following guide will show you how to rescue data from bricked Android mobile phone by using this tool. Step 1: Open Android Data Recovery program on your computer after you downloaded and installed it. Then plug your bricked Android phone to the computer and you will see the following interface occurs. Step 2: Preview and select the files you want by opening the different file folders from the left panel one by one. Then, choose the detailed files you need by checking the boxes in front of them. Step 3: After selected the files you want back, you can start the recovery process by clicking on the "Recover" button. Choose a location on your computer to save the recovered Android data.